Some of my friends did and even sent in a letter. They’ve received responses similar to this! You can check it out online here. SO OK. LET’S READ TOGETHER if you can’t read the pic above. The reason for the lack of funnies now. 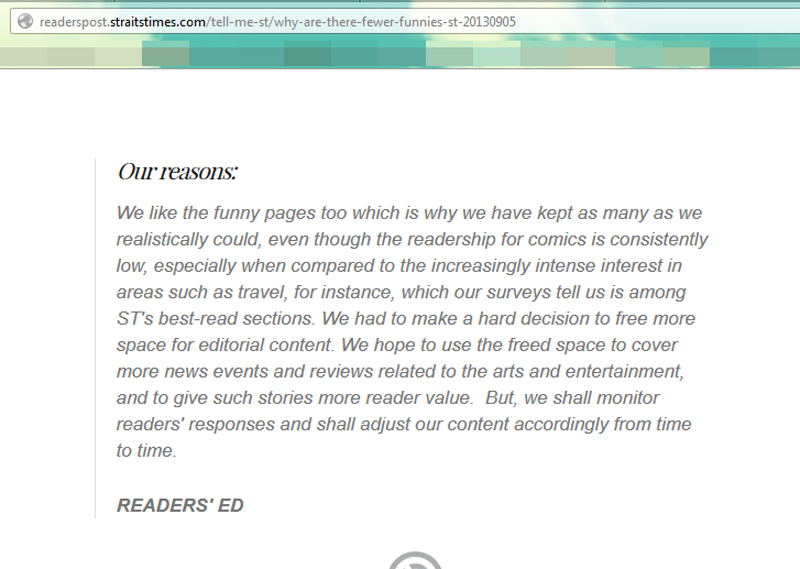 We like the funny pages too which is why we have kept as many as we realistically could, even though the readership for comics is consistently low, especially when compared to the increasingly intense interest in areas such as travel, for instance, which our surveys tell us is among ST’s best-read sections. We had to make a hard decision to free more space for editorial content. We hope to use the freed space to cover more news events and reviews related to the arts and entertainment, and to give such stories more reader value. 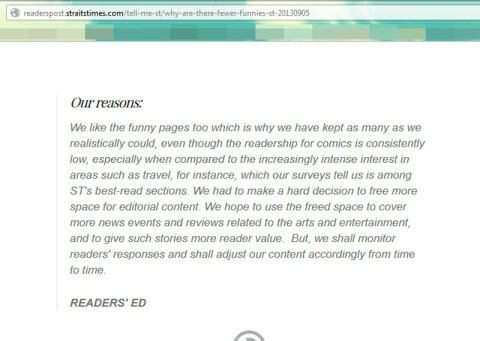 But, we shall monitor readers’ responses and shall adjust our content accordingly from time to time. I was like, ok. Sure. More news events and reviews related to arts and entertainment. I support that especially if it’s gonna be local stuff since they totally need support. And for the past week, I monitored/read the lack of section while everyone held their breaths. Metaphorically because if they did that literally, they’d be dead by now. I feel so cultured now that I should be given SKLO’s vinyl cultured toys. PLEASE LOR. Does that look like news events or reviews? Ok. Maybe if you wanted to stretch the definition like how large amounts of water is called ponding, then ok that is a news event. 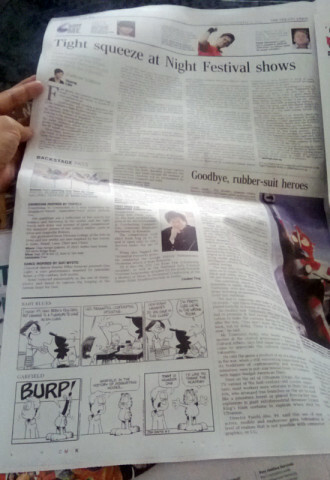 Why am I lamenting the lack of comics in the newspapers? Well, out of the OTHER news papers here, only ST had the quality ones. Until now. Now ST is like any other regular paper here. Well, maybe a little less trashy than some but it’s just so serious. If I wanted news, I would go online and read it. There’s SO many sources online and heck, there’s the Today paper! WHICH IS FREE. Ironically, the comics section was reduced when they were featuring the Singapore Toy, Games, Comics Convention! Look, it may be odd but not everyone has a computer. If you’re reading this, you probably have one but for those who don’t, that comics section means a lot to people. It’s not just drawings. It brings joy and it’s like an introduction to comics! When I was a kid, I read the papers not because of the news. I checked the funnies first and THEN noticed the news. Also, the funnies has such good ways of simplifying important matters to be understood to all. Reduce, sure but if you want to do that maybe you want to feature local comic artist’s strips? If you don’t know who you can ask me and I’ll send you their way. That’s how you can promote more arts/reviews too, non? Come on, it’s not as if we don’t notice that there has been cuts in other pages too like movie listings. That one is probably more on the cinema side not wanting to pay for bigger ads though but at least that is semi understandable although annoying. Heck, I guess the bottom line is: Ok lor, you want to put more ads on that section, don’t complain why people complain on the lack of comics. You’re gonna see that for quite a while since it’s your own fault. 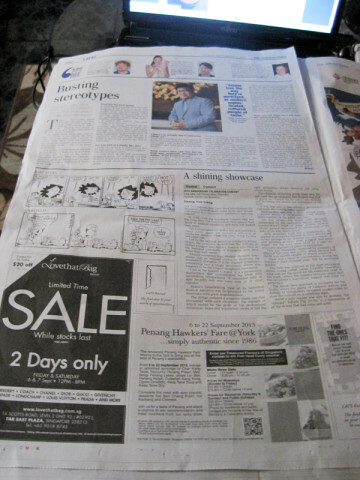 Meanwhile, I’ll still read the Straits Times because it still at least has the horoscope section. When it cuts that one out… Well, we’ll see what happens. Next Next post: We’re reading alright.